Garden hoses are a necessary staple for lawn and landscape. The hardest part in selecting a quality hose is picking one made from materials that are best adapted for your intended use. Whether you want a soaker hose, a rubber garden hose, an expandable hose or one that offers a lifetime warranty, you need to choose the best garden hose that is strong enough to handle the daily rigors of your outdoor work. This buying guide highlights the different types of garden hoses, fittings, nozzles and maintenance requirements of hoses so you can get the job done. 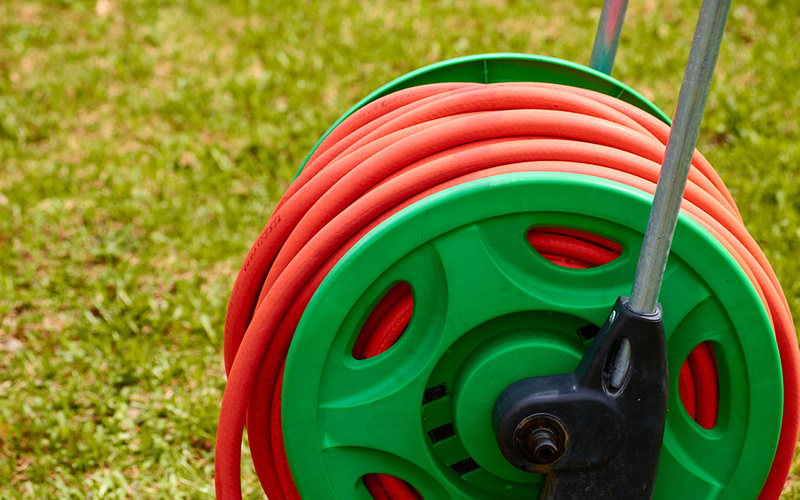 Garden hoses may not be the most fascinating tools in your landscaping arsenal, but they are an absolute necessity for watering the lawn and garden. 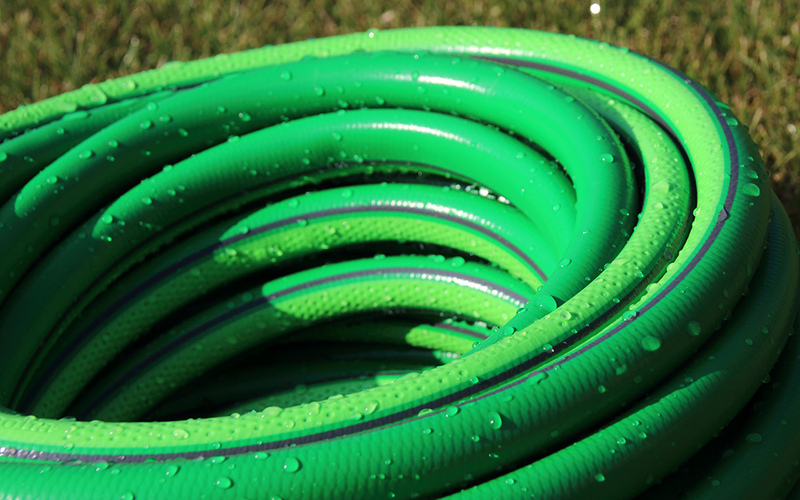 Choosing the best garden hose for your home will depend on your usage, climate and budget. Before you buy a new expandable hose or a shiny new brass garden hose nozzle to water your yard, here are a few things you should consider when shopping for a hose. Hoses are generally made from vinyl, rubber or a combination of the two. They are also constructed in different layers, or ply. The more ply the hose has, the more durable it will be. Vinyl provides an economical choice that is best for mild climates and lighter watering tasks. Vinyl hoses are usually reinforced, but are not as durable as rubber hoses. 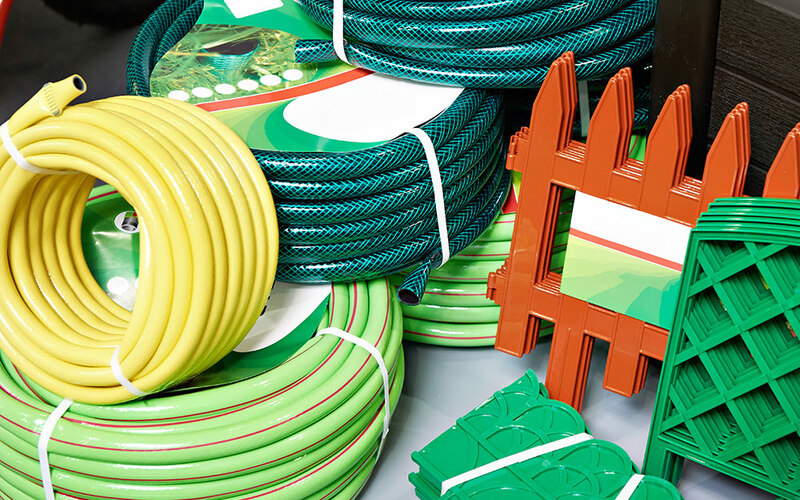 A rubber garden hose requires a larger up-front investment and weighs more than vinyl hoses. Rubber hoses are tougher, more durable under harsh weather conditions and have the ability to carry hot water. Hoses comprised of the two are priced in the middle, providing rubber’s flexibility and durability along with vinyl’s lighter weight. These hoses may be reinforced with a number of layers for greater resilience. Some also feature an outer mesh layer to protect against snags and punctures. Some hoses have metal coils or cords between the layers of rubber or vinyl to help keep the hose from kinking. Nylon and rayon may be used to reinforce hoses for greater strength and durability. The length, diameter and fittings of a hose will determine its water flow capacity. Hoses can be found in 25-foot increments up to 100 feet. Longer isn’t always better. The longer the hose, the harder it will be to maneuver it around plants and other obstacles. The best way to determine the length you need for your yard is to measure the farthest distance you need to reach from the spigot. Buy a hose slightly beyond that length for best results. This will give you room to move about your yard without having to tug on the hose. Hose diameters range from ½- to ¾–inch diameters. Standard household piping is typically ½ inch in diameter, so a garden hose size of ½ inch in diameter will suffice for most lawn and garden uses. Larger diameter hoses are better suited for heavy-duty watering tasks. Commercial landscapers benefit from larger diameter hoses because of the heavy water flow. The fitting, or coupling, is where the hose attaches to the water supply. They are the end pieces that attach to spigots, sprinklers and nozzles. The main choices for fittings are metal and plastic. Metal, usually brass fittings, is more durable than plastic, but harder to tighten on the spigot. Octagon female fittings are easier to maneuver than standard round fittings. 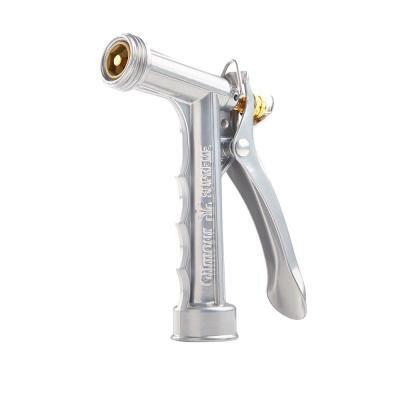 Pistol grip nozzles feature pull-style handles that allows you to change the pressure and style of spray as you squeeze. Watering wand nozzles extend your reach by up to 30 inches. They are great for watering tasks that are difficult to reach. Fan nozzles feature widened mouths that spray a wide, gentle spray of water. They perfect for gentle watering of delicate foliage. Fireman nozzles are versatile and can put out a large amount of water in a very short time. They are perfect for large watering jobs. Pattern nozzles are the most versatile of all nozzles. They offers the flexibility of many different types of spray patterns to cover all your watering needs. As you shop around for the best garden hose, you will see hoses categorized as light duty, medium duty, heavy duty or super duty. Heavy-duty hoses have thick walls and are very sturdy. They can be left exposed to the elements without risk of damage. Lighter weight hoses are not as durable, but they are easier to wind up and store. The heavier duty the hose is, the more water pressure it can handle. Use heavy-duty hoses for pressure washer tasks. All hoses are flexible in sense, but some are more so than others. Stiffer hoses are less likely to kink while in use, but they can be heavy and cumbersome. On the other hand, flexible hoses are easy to move around the garden, but they are more likely to kink. Aim for a garden hose that’s flexible enough for easy storage and going around corners, but not so flexible that it kinks easily. When shopping for a hose, use the “U” test. Bend the hose into a “U” and if it kinks, choose another. In general, aim for a rubber, reinforced garden hose for general use. They are less likely to kink. This is an all-purpose hose that works for general watering and cleaning tasks. You can get them in various materials and sizes. This hose acts as a sprinkler and soaker in one. It’s a water-saving option with a flat base on the bottom and holes on top to cast water in a mist-like rain. It’s ideal for general lawn and garden watering purposes. Lies flat until water pressure causes it to become round. This hose is easy to store, takes up less space and is self-draining. This type of hose has specialty hose springs for a tight coil when not in use. It’s great for hand watering in small areas. For a lightweight option, this scrunchy looking hose expands up to three times its length when filled with water. Expandable hoses are good for small yards and gardens. Features a nontoxic core, safe for drinking water from and ideal for use in recreational vehicles. Most standard hoses are not drinking water safe. They have plasticizers which help give the hose flexibility, but also contain chemicals, like BPA, lead and phthalates that can leach into the water. Any hose marked as a “drinking water safe” is lead free, BPA free and phthalate free. Marine and RV hoses are drinking water safe. This type of hose is puncture and kink proof. It’s made out of industrial stainless steel but remains lightweight. Metal hoses stay cool to the touch and are corrosion- and UV-resistant. Garden hoses may be a small investment but having to replace them every year will can end up costing you a lot of money. With a few simple care tips your hose will last for many seasons to come. Extend the life of your hose by draining it after each use. Turn off the water at the spigot or shutoff valve. Release the remaining water pressure from the hose by engaging the nozzle. Disconnect the hose from the spigot and let the water drain out. Another easy way to extend the life of your garden hose is to store it on a reel when it’s not in use. Simple hose hangers or a garden hose reel will keep your hose neat and out of the elements, which will add years to the life of your garden hose. Look for kinking as you coil or uncoil your hose. Kinks in hoses cause damage to the hose’s wall which will tear or split open, causing a hole in your garden hose. No matter how well you care for hose, eventually, you will get little pinholes. These holes can be easily repaired with rubber patch kits. Store your hose in a garage or basement during the winter. Hoses will contract and expand with the cold and heat, which will damage your hose. During the cold months, store it where it won’t be affected by the elements. When looking for the best hose to suit your watering needs, think about the tasks you will need to use it for the most. Your local Home Depot carries many types of hoses and you can consult with a Home Depot Store Associate on the best garden hose to suit your needs.